An injera (also spelled enjera) is an Ethiopian specialty. It is a fermented pancake. In Ethiopia it is staple food and is served at almost every meal. 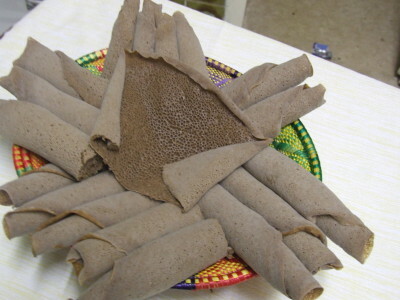 An injera has a distinctive light sour taste and spongy texture which makes it ideally suited for sopping in curries, stews and other wet dishes. Teff is completely gluten-free. 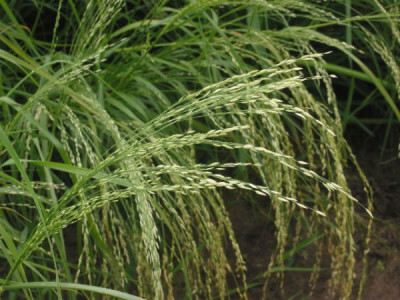 So people with celiac disease (gluten intolerance) or gluten sensitivity can safely eat teff. Do you want to eat entirely gluten-free with us? Please feel free to contact us and let us know that one day in advance. Then we make gluten-free injeras especially for you. The high iron content in teff stimulates the formation of red blood corpuscles, which improves your endurance and performance. The slowly digestible carbohydrates also have this effect. Ethiopian long-distance runners are convinced that they perform better because they eat teff regularly. 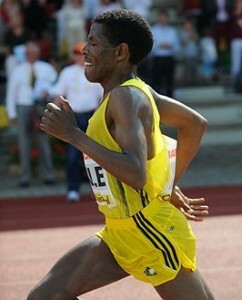 Many top athletes that run races over 5 and 10 km and win the marathon, such as two-time Olympic champion and eight-time world champion Haile Gebrselassie, eat teff daily. 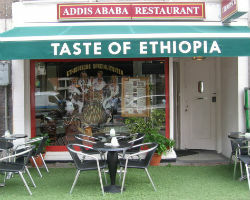 By the way, Haile Gebrselassie is a regular customer of restaurant Addis Ababa. Whenever he is in Amsterdam, he goes there to eat.